Sonora Elementary School in Costa Mesa has lots of spirit and now they have a Green Team to harness their spirit about recycling! Thanks to Ginger Castillo, the Sonora Green Team is off to a fantastic start. Over 50 kids joined the team for its first year. To kick off the 2010-2011 school year the Green Team is currently holding a Recycling Rally. On Day #1, Torelli Realty and Orange Coast College kicked off the rally with assemblies for the student body that educated the students more about recycling. The presentation was a great way to gear up for the Recycling Rally slated for October 15-21, 2010. Students have been asked to bring in all of their empty plastic water bottles and soda cans. Each classroom is keeping track of the amount of bags they bring in. Then all the goods are being shipped over to the Orange Coast College Recycling Center. Sonora Elementary School now has an account at OCC (thanks to Michael Carey – AKA “Recycle Mike”) so people can bring these items to the OCC Recycling Center and the money can be credited to Sonora. At the end of the rally, there will be 2 prizes: the winning classroom of the younger grades will get a pizza party and the winning classroom of the upper grades will win a trip to the landfill. More than raising money, the purpose of the Sonora Green Team is to teach the students about how their actions impact the world through recycling and energy efficiency. Students are taking simple steps in the classroom to reduce waster by writing on the backside of paper. In the future they are looking to waste-free lunches. As a local real estate company, we are proud to see our students learning about such an important issue. Sustainability is important in real estate and home construction too. We all want the environment we live in to thrive. Go Sonora Green Team! 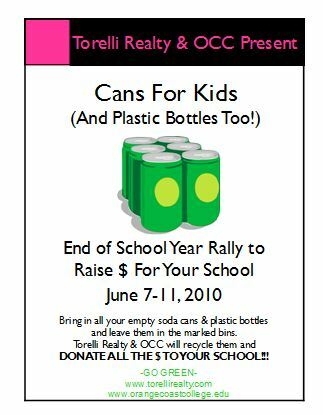 Torelli Realty and OC will be doing another Recycle Presentation and Recycle Rally at Adams Elementary School in the near future. Would your school like one? Let us know at holly@torellirealty.com. We will also be providing the results from the Sonora Recycle Rally at the end of the week. We’re making it a priority to go GREEN & going GREEN can help bring in GREEN for our Costa Mesa schools! Join us as we team up with Orange Coast College to help Adams Elementary School & Sonora Elementary School in the CANS FOR KIDS RALLY June 7-11, 2010. Students should bring in aluminum cans and plastic bottles and drop them in marked recycling bins at the schools. All of the money from this recycling effort will be given to the schools. The rally will wrap up at the Costa Mesa Community Picnic on June 12. Let’s hope this is a big success so we can expand it to more Costa Mesa schools next school year. Start saving your cans (and plastic bottles) now! A special thank you to Mike Carey, Sustainability Coordinator at OCC. 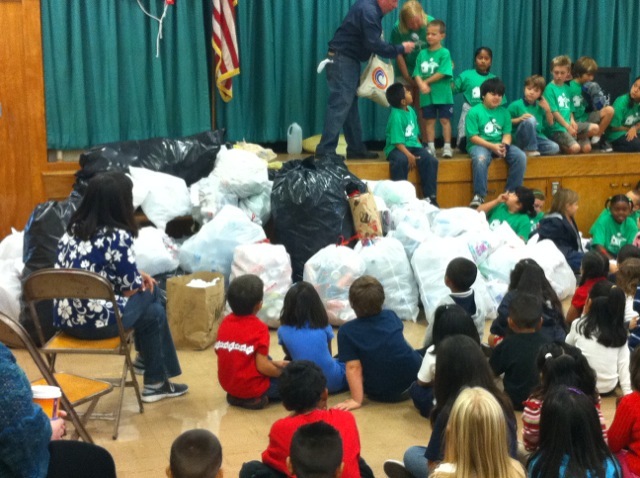 Mike will be giving presentations at the Costa Mesa school Adams Elementary to teach children more about recycling. Please leave us a comment and let us know what schools would like to kick off the 2010-2011 school year with a recycling rally!